It’s always interesting to go back to a place which I’ve had a part in designing to see how it’s developing. 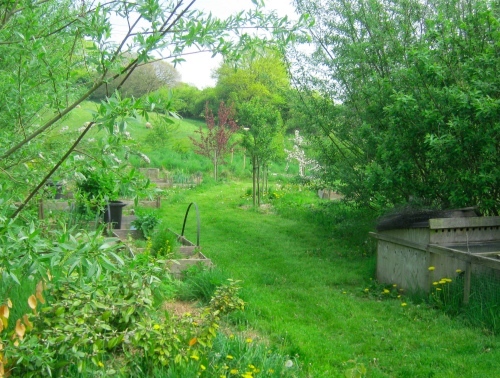 Three and a half years ago I gave some advice to Bryony Huntley on her forest garden. Now it’s part of the Permaculture Association’s LAND network of permaculture sites open to the public and last weekend Bryony held an open day there. I gave a talk at the day and Bryony showed us round the garden. The first thing to do when establishing a forest garden is to plant the trees. Usually all of them go in in the first year. As long as they’re planted at the right spacing there’s not much that can go wrong. But the question remains of how to deal with the ground layer. When the planting is completed it will be completely planted up with perennial vegetables and ground cover plants. But it’s never possible to get enough plants together to do the job all at once. The quantity required would be astronomic. One of the keys to success in establishing a forest garden is how you go about planting up the ground layer. The way not to do it is to scatter herb and shrub plants about the garden, each one isolated in a sea of grass. They suffer from competition from the grass and make it difficult to cut the grass, either with a scythe or by machine. The secret of success is to plant up a small area each year, with the plants at a close enough spacing that, once the mulch has decomposed, they can form a closed canopy and suppress unwanted plants such as grass. The rest of the area can be kept in order by cutting the grass between the trees. This way the number of plants you need to propagate each year is manageable. This part of the forest garden so far only contains wide-spaced fruit trees and the original grass. Bryony hasn’t started planting up the ground layer yet. But she is trying out various plants to see how well they grow in her local conditions and growing some annual vegetables. She does this in the boxes you can see in the picture. They enable her to grow her crops without too much ground preparation and with some protection from invading grass etc. Wisely, she has concentrated most of them in one part of the garden. This avoids the problem of fiddly bits of grass to be mown. One of the wwoofers who’s been working there told me that in her opinion it would have been even better to locate all of the boxes in one area. It would make the work that much easier. The boxes. 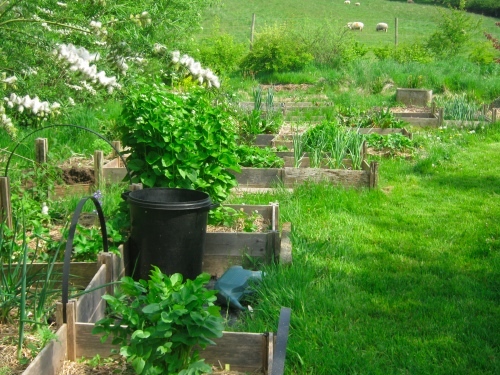 The plant in the foreground is skirrett, a perennial root vegetable. 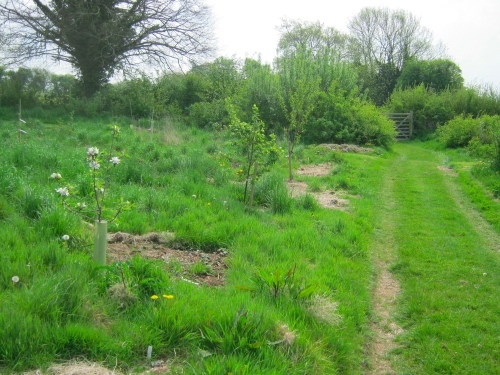 Before planting the trees Bryony had to put up a deer fence right round the forest garden. There’s a strong local population of deer and without the fence you couldn’t grow anything there, tree, shrub or herbaceous, with any likelihood that it would survive. The willow windbreak in the background. She also planted a windbreak of willow. This was essential too as without it the garden would have been severely exposed to the south west winds. The windbreak is already becoming very tall and competitive so she plans to start coppicing it. It’s made up of several lines of willow, so it’s possible to coppice half of it, leaving the other half to provide shelter till the first part has regrown, and then the second part can be coppiced. She has someone growing willow on another part of her land who will take the harvested material: all part of the integrated system she’s building up on Westfield Farm. 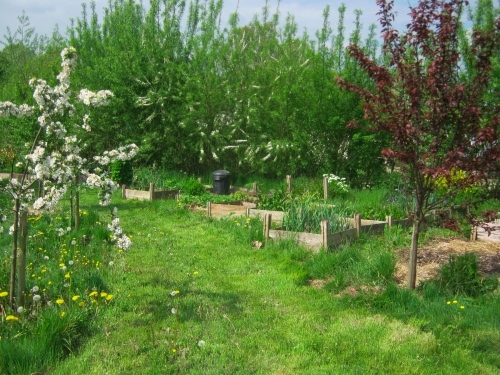 If you want to learn how to design a forest garden why not come on our Permaculture Design Course, 16th-28th June? The teacher for this subject is Caroline Aitken, co-author with Martin Crawford of the forthcoming Food from your Forest Garden. Click here for details.